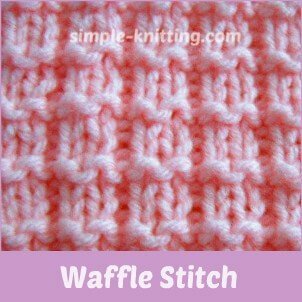 The waffle stitch pattern is simply lovely and creates a nice textured pattern on your fabric. 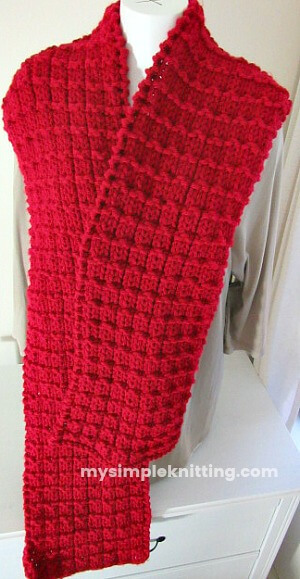 And because it is made with knit and purl stitches it's a great pattern for beginner knitters to practice with. All you do is alternate the knit and purl stitches which creates the bumps, just like waffles. I love the feel of the fabric when I knit this up, kind of nice and cozy. I can just imagine a nice soft blanket with this or even a pullover sweater. It's not really reversible but the wrong side doesn't look too bad. You'll have to decide for yourself when you knit it. Because this pattern lies flat you don't necessarily have to put a border around it. I am thinking of when you knit dishcloths and tea towels. Wouldn't it make a really nice tea towel set? Or even some nice table placemats. What a great way to add a splash of color to your kitchen. It's so nice and stretchy too which leads me to another thought. If you are going to be making any knit gifts like hats, socks, mittens, things like that and you don't have the exact size, you can use this stitch pattern. That way if you do knit something a little small it will stretch. You know what I mean? It's just a nice thought to keep in mind when the time rolls around for making gifts. This lovely stitch pattern would make terrific thermal knit under garments. What a great way to keep your kids, toddlers and babies nice and warm when they are outside. Just don't forget to make yourself some too. Scarves, cowls and fingerless mittens are all great ideas as well so go ahead and get started with this simple stitch pattern and let your imagination flow. If you'd like to knit a sample cast on 13, 16, 19 or 22 stitches. This completes the waffle pattern. Would you like an easy knitting pattern to practice with? I used the waffle stitch for my super scarf so you could practice. Here's the link to my super scarf knitting pattern.